Gorgeous Shonas Highlands home! 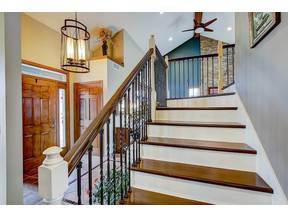 2 story foyer welcomes you inside w/beautiful hardwood staircase & soaring ceilings. Stunning kitchen w/custom cabinets, granite counters, island & walk in pantry (2012). Relax at the end of the day on your front porch or grill & entertain on expansive deck. Master bedrm oasis w/fabulous walk in closet. Huge finished lower level w/family rm, game room, & full bathrm. Heated oversized 3 car garage w/hose bib and access to basement. Close to parks, bike path, beautiful new elem. school, shopping, & more. *Per Seller, home was started in 2003 but interior was not completed until 2014.